Mons to Brussels via the Canal de Centre and the Charleroi/Brussels: 68 kms, 11 locks, two of them are unique and fantastic engineering marvels: Strepy-Thieu funicular boat-lift and the Ronquieres inclined plane. 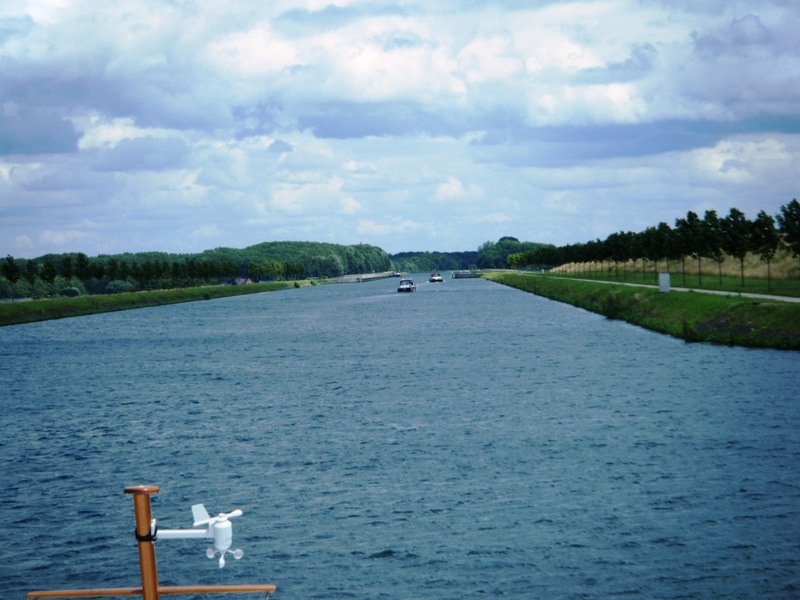 A little about these waterways: Water transport only accounts for 2.2% of inland freight movements in France, compared with 12% in Germany, 16% in Belgium and 33% in the Netherlands (zero in Australia and not much in Britain). 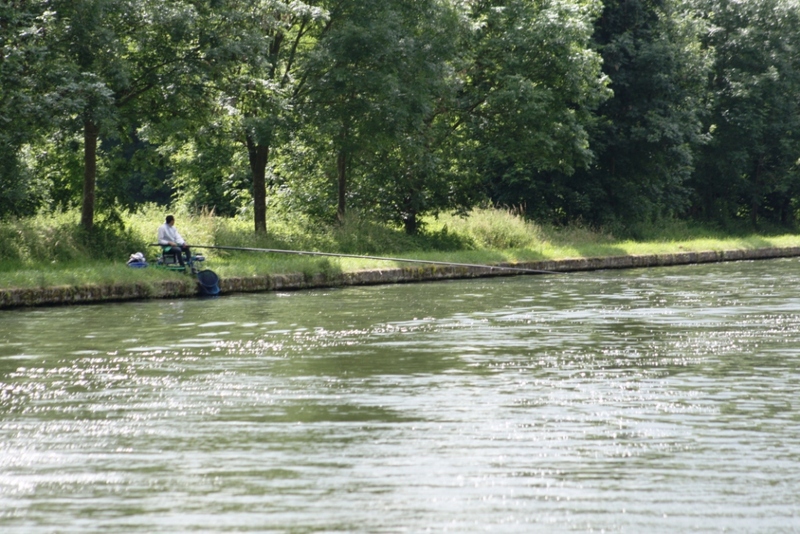 And perhaps if France adopted some of the strategies of these other countries a lovely waterway like the Canal St Quentin (and quite a few others) wouldn’t be so deserted. 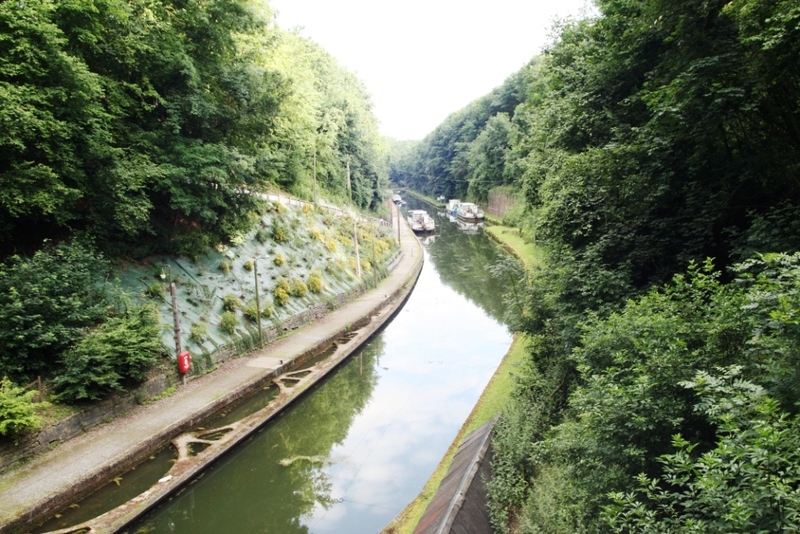 Very wide and open waterways (Charleroi-Brussels canal). We didn’t fully appreciate what a beautiful canal the St Quentin was on our first visit in 2009 when we were less experienced and perhaps too focused on the challenge of the long tunnel (almost six kilometres). 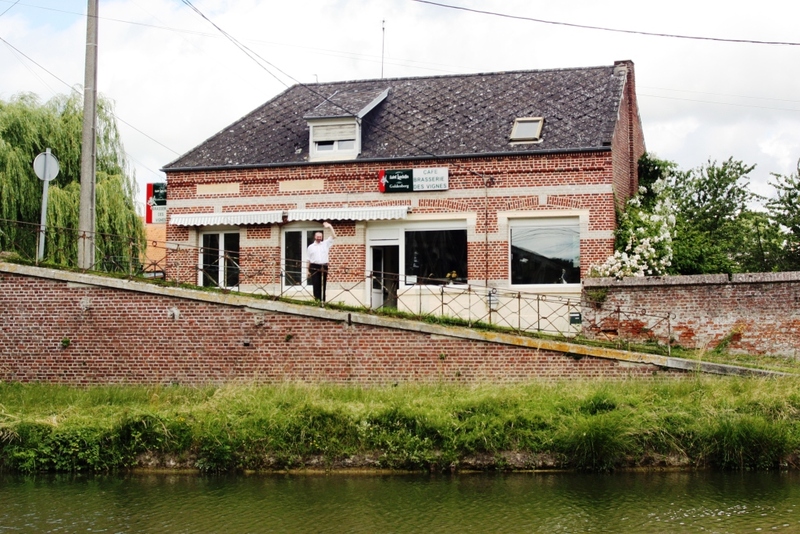 Since then we have used the Canal du Nord twice in preference to the St Quentin because it was faster. 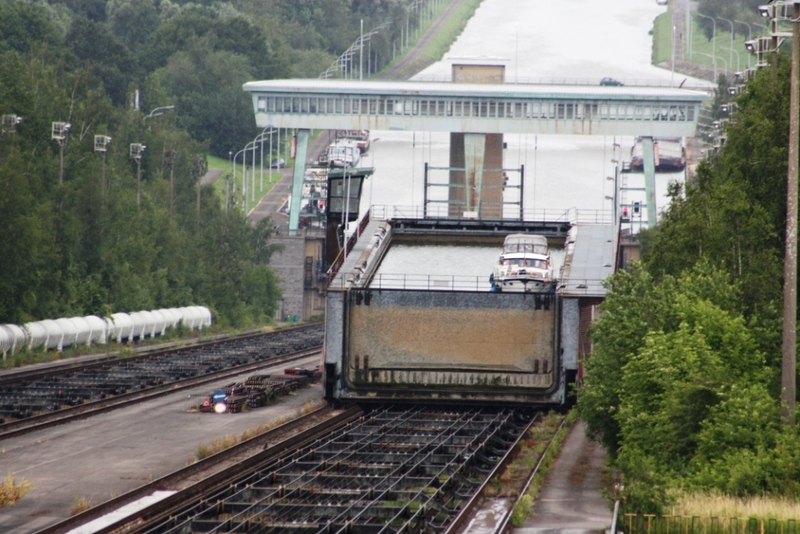 It runs adjacent to the St Quentin about 20 kilometres or so west doing much the same job but is designed as a ‘motorway’ for big commercial barges. It seems that most boats and certainly most of the commercials these days do choose the motorway and the St Quentin was worryingly quiet. The St Quentin tunnel, where we were heading next, was opened by Napoleon in 1810 and had huge historical significance during WWI as it was close to the Hindenburg Line and was used by the Germans for shelter, ammunition storage, a hospital and administration. A link here with more information: http://waruntold.com/detail_thenandnow/19/. When we set off from St Quentin (the town) as mentioned in our last blog we’d allowed plenty of time to ‘catch’ the 3.00pm tow through the tunnel. The beautiful canal St Quentin once we were through the short tunnel. 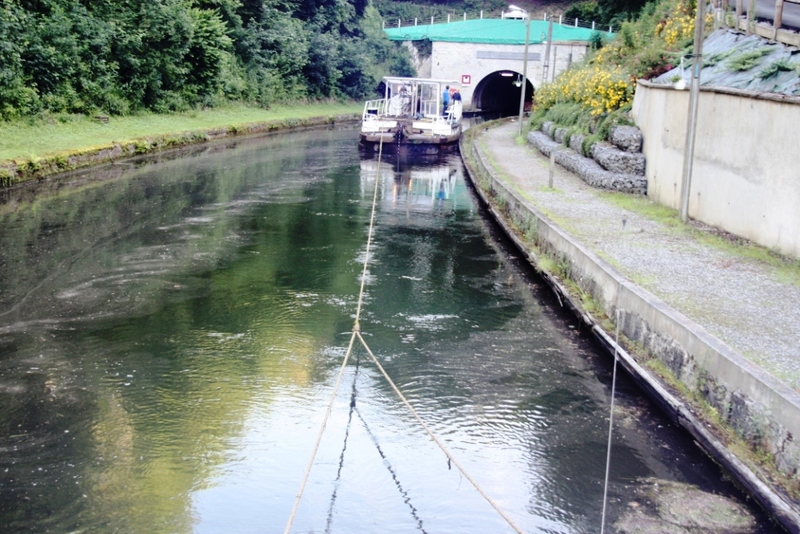 We arrived at the waiting basin at 1.30pm and a rare to see VNF lock-keeper was there to tell us in French only that we’d have to wait until 3.30pm (two hours) to use the short tunnel. He said something that seemed to indicate we wouldn’t be towed today .. we couldn’t believe our ears. We thought there had to be a bit of confusion in my translation over the two tunnels, one being one kilometre long which we navigate ourselves and the other almost six kilometres which they tow us through. We waited and at 3.30pm as promised we had a green light for the short tunnel and as explained in various guides we continued to the Riqueval waiting basin just before the big tunnel. It was by then close to 5.00pm and we couldn’t see a tow happening at this late hour. 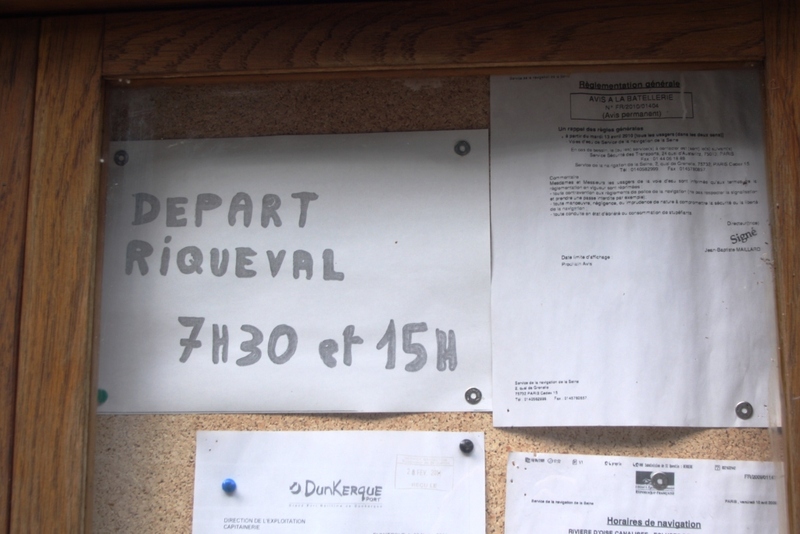 Handwritten sign at the beginning of the long tunnel on the canal St Quentin – we won’t be leaving tonight. There was a sign in one of the windows of the closed VNF office stating that the Riqueval run (this end) left at 7.30am and 3.00pm .. so we had missed it. Sure enough at 5.30pm the tow boat appeared from the other end of the tunnel with two péniches (commercial barges) and a cruiser attached, they detached them and off they all went including the VNF men leaving us stuck at the beginning of the big tunnel for the night. Another odd mooring we said to ourselves, but in fact quite pleasant. It was dark down there and as dusk came the birds seemed to love the echo they made from their evening song. It was a little bit spooky .. we felt forgotten about. Later I walked up to street level and discovered another note on the Tunnel Museum and VNF office which mentioned towing times and these differed slightly, 7.30am and 3.30pm. We just had to hope that it all happened tomorrow at 7.30am. Endellion moored way down there in the cutting before the long tunnel, we spent a strange night there in this roofless tunnel waiting for the tow next morning. Happily the VNF crew arrived at 7.20am, hitched us to their prehistoric tow barge (the identical one to the museum model up at street level) and for one hour 45 minutes we sat in the dark being towed along the narrow tunnel. 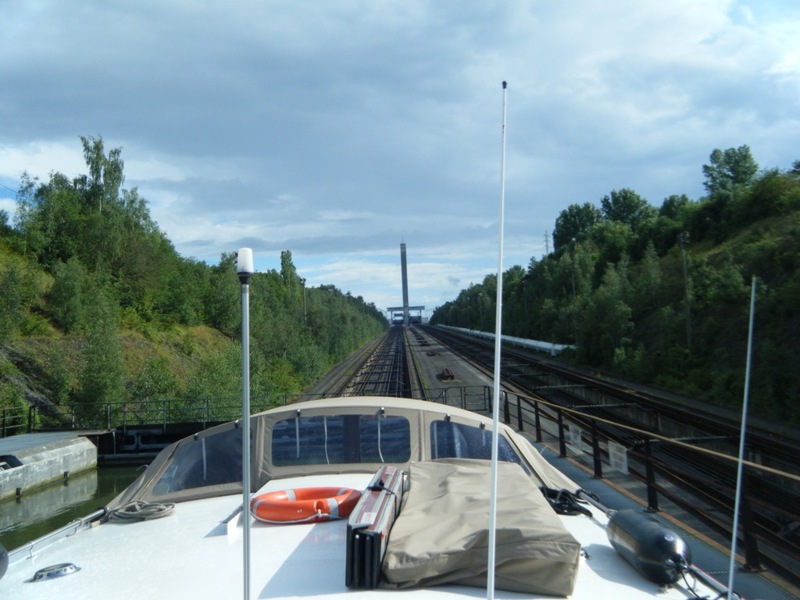 All we could see inside the long tunnel (almost six kilometres) was the tow boat ahead of us. We were the only boat, so the long tow was not very financially rewarding to the VNF as we will be billed just over EU25 ($30). Under tow finally to pass through the almost six kilometre tunnel near St Quentin. It appears they had reduced the number of runs through the tunnel because there simply are not enough boats using it. 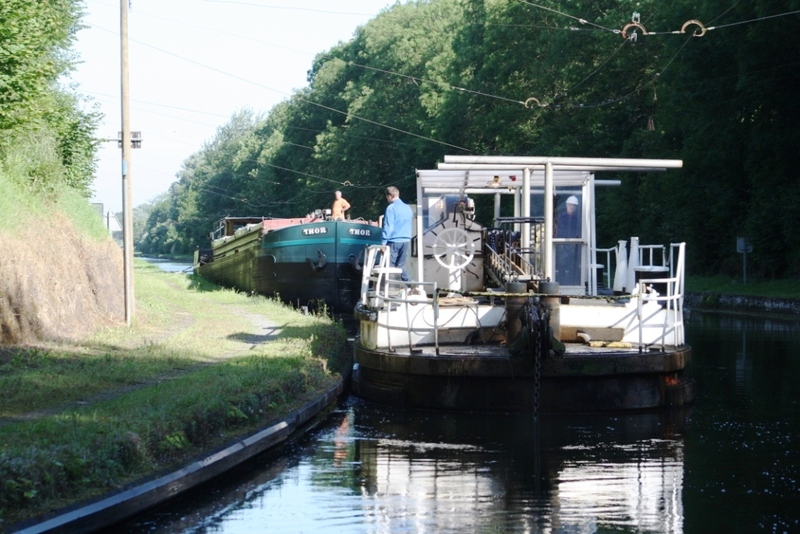 The Quentin is one of the most scenic waterways and provides a superb run of automatic locks, all quick and functioning without any hold-ups. 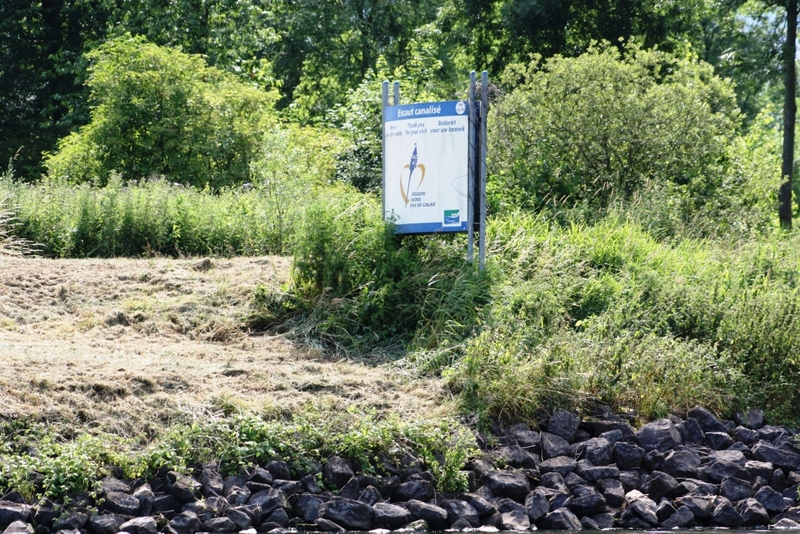 Let’s hope more pleasure boats, and commercials, start using it especially now as it appears the ‘new’ canal north (Seine-Nord Europe canal) is not going ahead. Finally at the end of our trip through the big tunnel the tow barge releases us ready for the commercial barge. 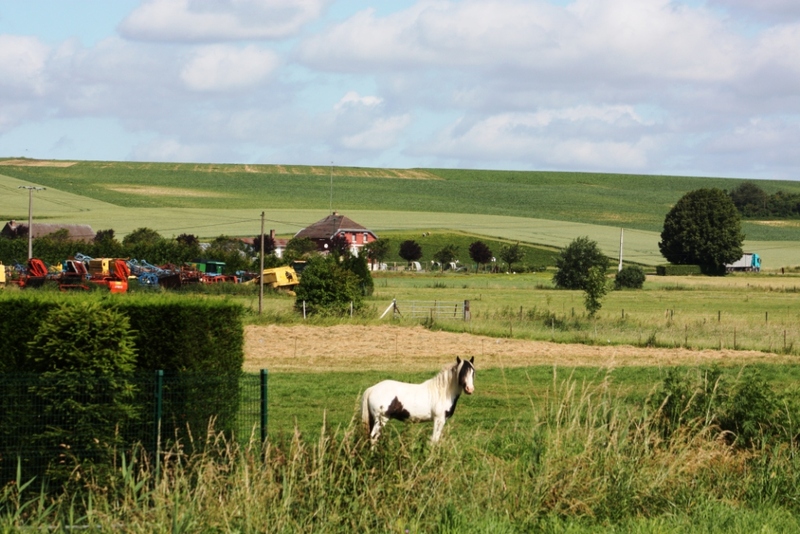 Beautiful countryside all along the canal St Quentin. 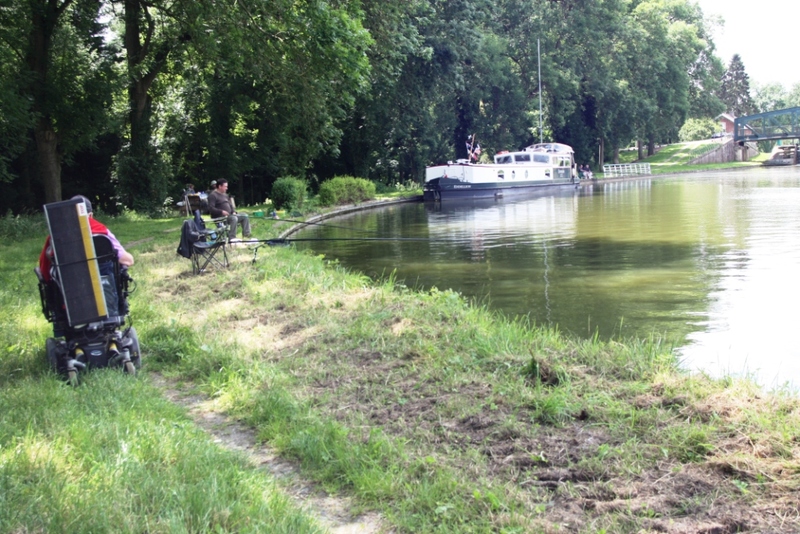 Endellion moored amongst the fishermen (who ignore us) at Vaucelles on the canal St Quentin: one of the most beautiful moorings. 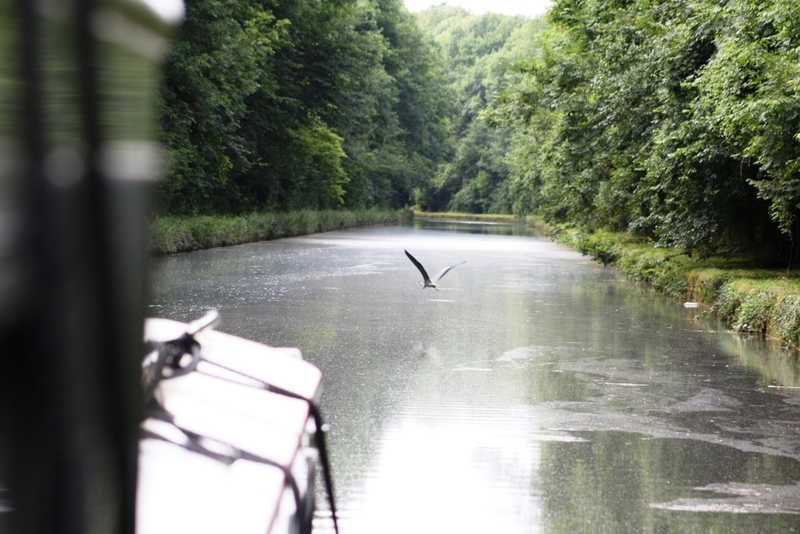 The canal St Quentin .. as mentioned above, is a beautiful stretch of water and along the way we moored again at Vaucelles to visit the Abbey and gardens just as we did in 2009 but at that time it was the one day they were closed. This time we knew we had our timing right, a Sunday, but when we arrived it was again closed, this time for a wedding. Luckily staff had left the locked door ajar and we entered and found the wild and wonderful garden. 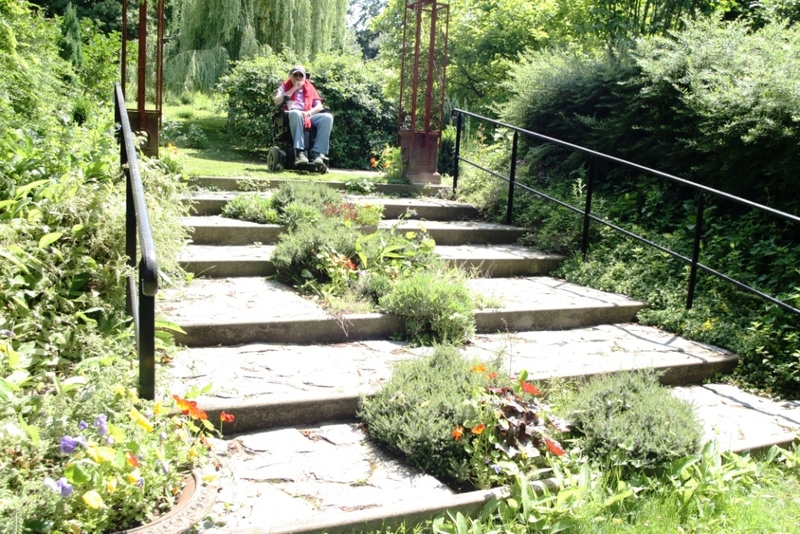 Stewart ready to enjoy the fabulous gardens at the Vaucelles Abbey on the canal St Quentin. It was laid out in a semi-orderly manner stacked with interesting grasses, berries, vegetables and of course flowers. This is one of the most beautiful moorings we’ve found to date, and the same as in 2009 the fishermen also love it and surround us with their amazing rods which are sometimes as long as 20 metres! Leaving Endellion with the fishermen as we set off to find the elusive restaurant. As usual they completely ignore us.. there is something that doesn’t quite gel especially in France, between fishermen and boaters! From our Vaucelles mooring (amongst the fishermen) we headed off by wheel to the next village, called Rues de les Vignes which we’d also almost visited in 2009 but the rain drove us home. The fishermen love to use amazingly long rods which they will not remove when they see a large boat coming.. they’d rather shake their fists! This time we had a good break in the weather so we cycled to find the elusive restaurant which was reasonably well sign-posted. We finally tracked it down, Brasserie Vignes, having missed one or two of the signs so taking a very long circuitous route! However, this meant we also found a centre for archaeology based around very interesting Roman ruins of Gaul / Merovingian / Carolingian. Unfortunately it was closed so we decided to save this for our next visit and headed on to the restaurant where we met Danny, the owner/manager who insisted on bringing a table outside in the sun for us. 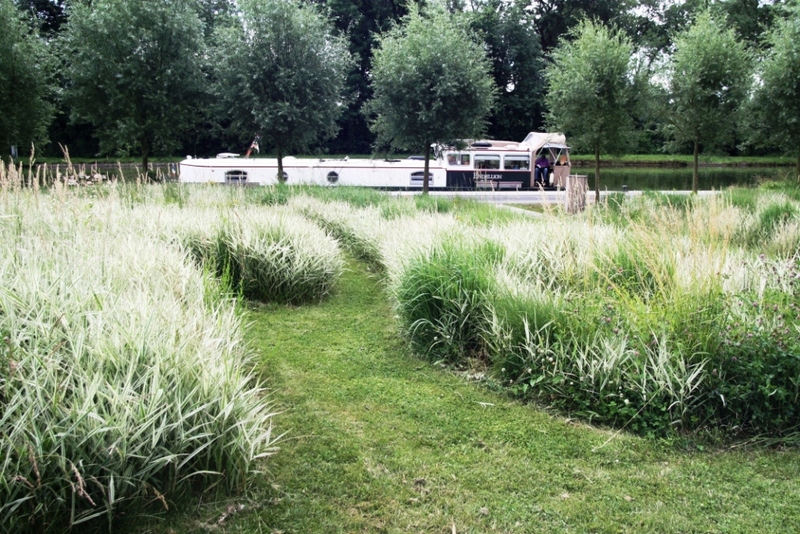 Moored at the beautiful park at Rues des Vignes close to Danny’s restaurant. We were by then very hungry and asked to see the menu. “Sorry, we have no food”. Not even an assiette (a plate of cold meat or cheese) I asked. Non. Nothing. Luckily we had bought a loaf of bread from a baker we’d passed on our long journey and so could pick at that whilst sipping our nice cold beer. A few minutes later Danny came out and chatted about his desire to move away from France, perhaps to Australia or New Zealand. He was a specialist in wild animals and kept live snakes here at the pub. We thought he’d fit in very well in Australia. He then said if we’d like to return tonight the restaurant would be open. So back to the boat where we upped anchor to potter down to be close to the restaurant for the night’s meal at Danny’s. Danny stands outside his pub to wave us farewell .. he was cook, barman and friend for the 24 hours we were moored nearby. We were greeted by him and his wife and one customer having a beer. Almost immediately we were served our starter, egg mayonnaise beautifully presented with sliced cucumber and diced cherry tomatoes and a side dish of home-made mayonnaise. There was no menu. When I asked about the mayonnaise, saying how lovely it was (true) Danny said it was home-made from his hen’s eggs. Next we had chicken which he’d roasted in a big glass oven-proof dish surrounding with potatoes and beans served together and sliced on the bar in front of us. We did wonder if this was one of the hens that didn’t perform in the laying department – and Stewart recalled one of his favourite phrases, “a mother and child reunion”. For dessert we had fromage blanc (like a yoghurt) with diced apple, the hero was shredded fresh mint from his garden. We’d ordered a bottle of wine (not from the menu which we never saw) by asking for white wine, perhaps a Chablis we said. Or perhaps a Riesling he said. We settled for the Riesling. Finally we had a coffee and paid our bill, a massive EU15 ($37) each including wine and the beer we had earlier. We were the only customers .. and we had a very lovely evening. Endellion moored in front of the scary big peniche (commercial barge) with a skulls head creatively painted on its bow. We must mention a few more towns before listing some our ‘Heart in mouth moments” on this stretch of our journey. 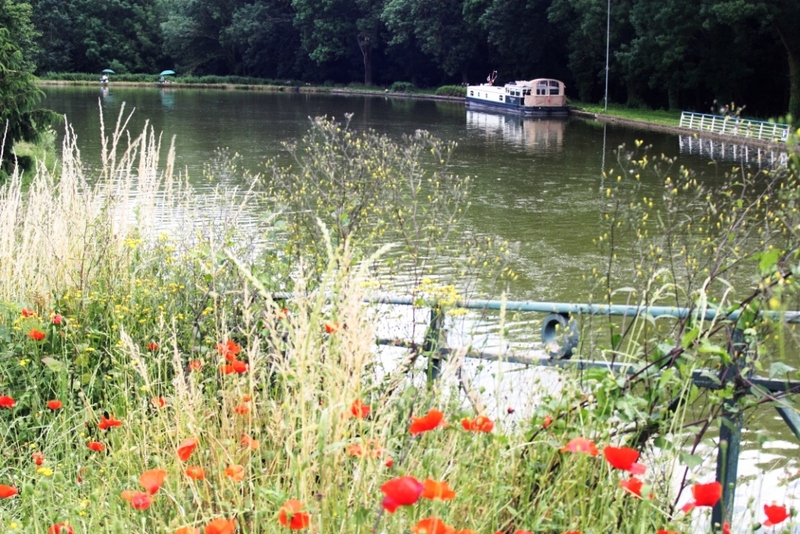 One happy find was Valenciennes, a town we’d skirted before and seen on several waterways but had missed this particular stretch of water, still in France but very close to the Belgium border. It is a town not well-regarded in tourist guides, quotes such as “a bruiser of a town fighting back after a wartime battering and economic decline”. 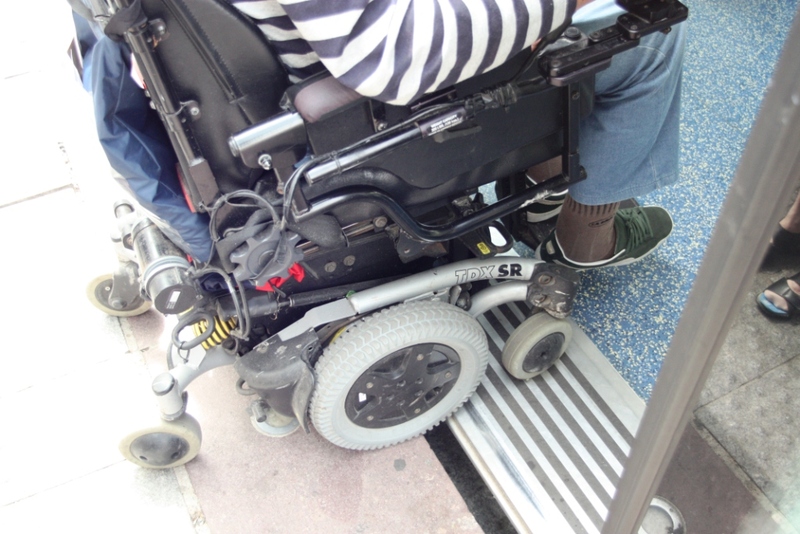 Stewart enters the tram at Valenciennes – the most accessible form of travel to date and a delight. We loved it, finding their excellent museum of fine art almost true to the one very positive view in the guide-book “matched only by the Louvre in Paris”. Their beautiful huge park, an excellent restaurant, the trams, the best we’ve seen anywhere – Stewart will talk more about these soon (link here). Leaving France and entering Belgium .. note how the grass has been mowed right up to the sign on the French side, but the Belgians haven’t got their mowers out yet. 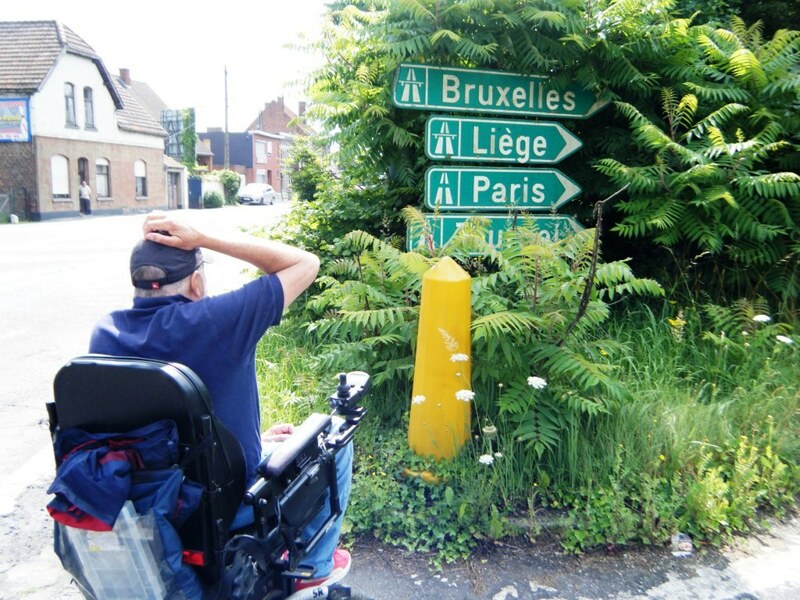 Stewart not sure whether to head for Paris or Brussels, trying to find Mons. 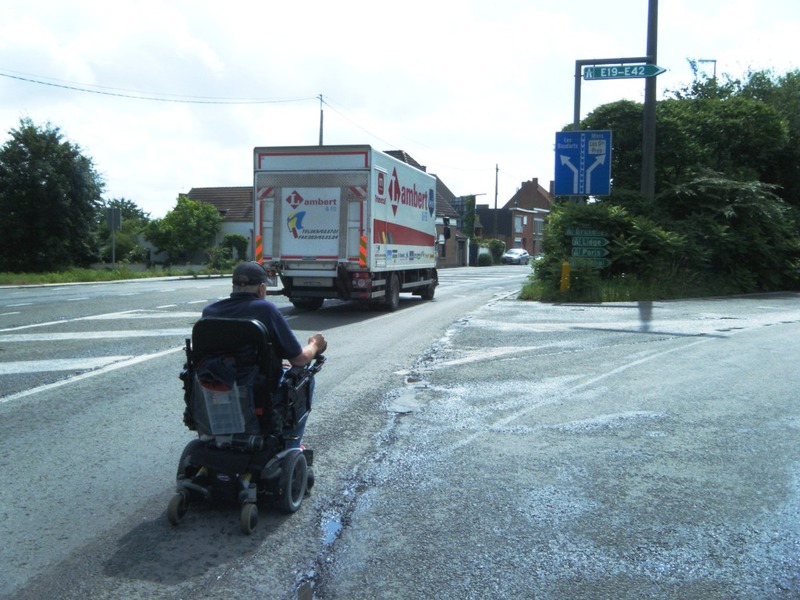 Stewart on one of our mad adventures where the only road into Mons was the major one .. we gave up as there were no pavements we could use. On again to the awful Mons .. sorry but now in Belgium and for our second visit to this town we were greeted here by the harbour master staff as if we had just committed some terrible crime to the community. In Mons we now found total disregard for any wheelchair access planning or maintenance. 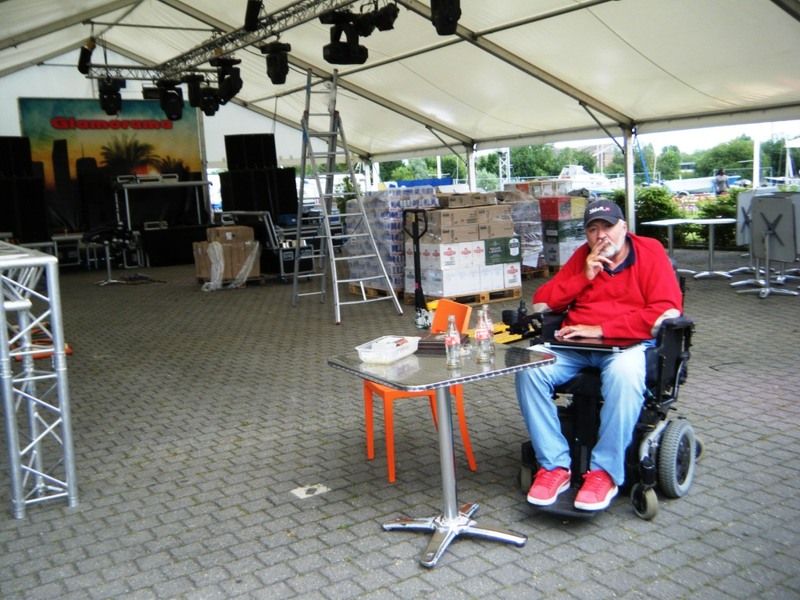 Stewart at Mons where they were setting up a huge disco (next day after we’d left) .. no access to the restaurant so we had to eat just the two of us in this marquee. The two lifts they had in this marina were both out-of-order and had been so, apparently, for more than 12 months. We couldn’t get into their restaurant and had to sit in the deserted marquee which they were setting up for a disco the following day. Getting into town which we’d read was very interesting was impossible as their buses weren’t accessible and when we tried to go by wheels there were no pavements so we had to use the extremely busy roads which in the end we found too dangerous. So we turned back to the safety of our home, our boat, and departed as soon as possible. That’s the only gripe (for now). Inside the ‘lock’ to take us up the 75 metres of the Strepy-Thieu funicular boat-lift. 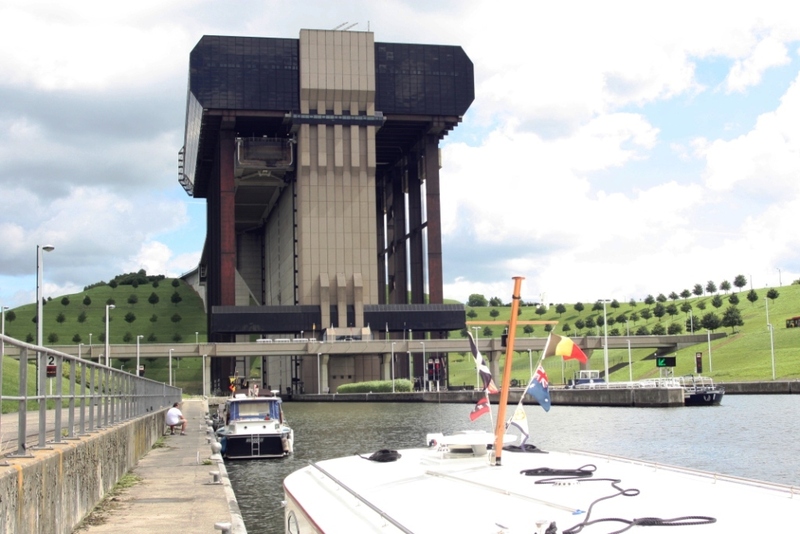 Arriving at the Strepy-Thieu funicular boat lift along the Charleroi-Brussels canal. The next few days of our journey were fantastic using two totally amazing feets of engineering designed to take boats up and then down again more than 70 metres each time. 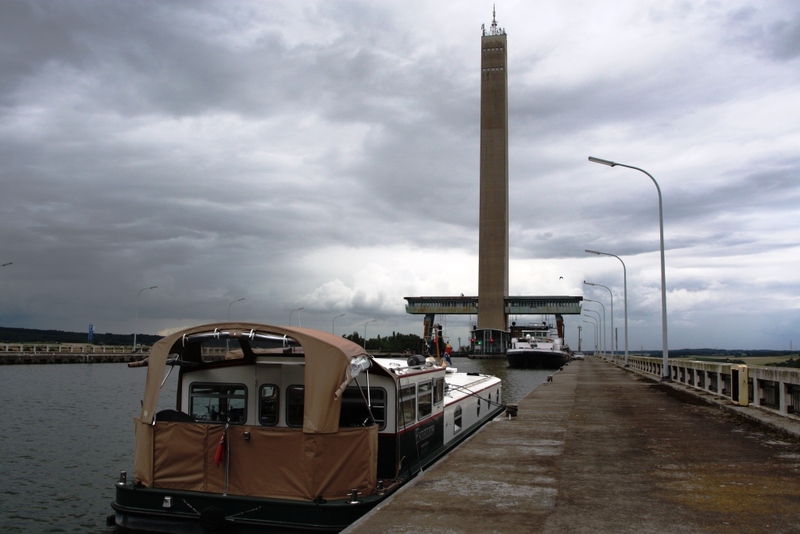 We’d heard the old Thieu lock on the ‘historic canal de centre’ was now functioning again and wanted to use their lift system (described as engineering reminiscent of the Eiffel tower) consisting of four sets of tanks (more here). 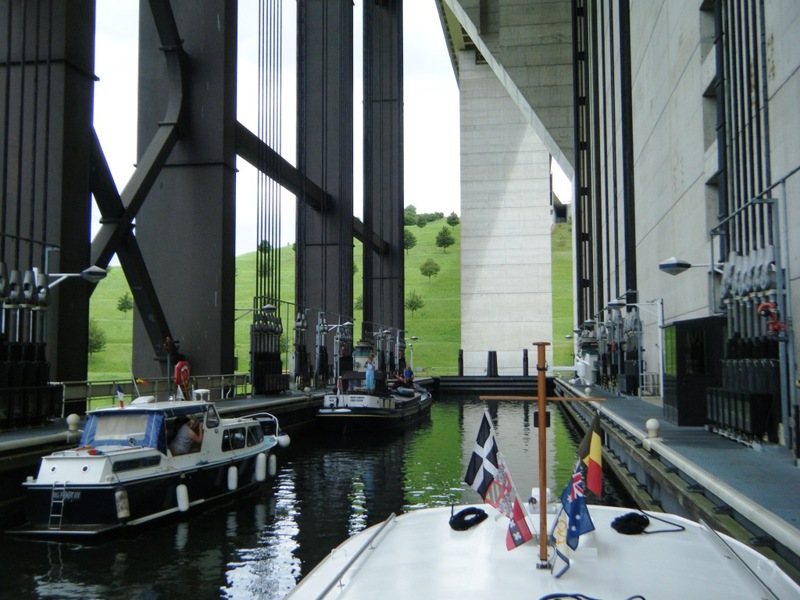 However, when we arrived at the lock into that section of canal we were told we were too long at 17 metres and had to go on to the Strepy-Thieu funicular boat-lift which we’d used before (see our 2009 blog). NOTE, as an update: Since the above visit and being rejected as we were too long, Rebecca and Michel on board their boat ’MS ‘t Majeur’ (www.t-majeureng.blogspot.com) passed on this message. Many thanks Rebecca and Michel .. happy travels. We will definitely try again when possible, and will check the days they are closed for maintenance. Endellion moored before the Ronquieres inclined plane waiting for our turn to enter the tank. Cruiser sits in the ‘tank’ coming up in the Ronquieres inclined plane which we will then descend in later. Back to the blog .. It was again a great experience but soon after, on the Charleroi/Brussels canal, we used the Ronquieres inclined plane .. an amazing system a bit like a train with its iron wheels and track but using a vast ‘carriage’ (tank) full of water in which we in Endellion sat and it then slid down, in our case, the track over a distance of 1.5 kilometres dropping around 70 metres. We sit in the tank, almost at the bottom of the Ronquieres inclined plane. We had only just gone up 75 metres in the Strepy so we’d travelled the equivalent of sixty or so average locks (they’re usually around 2.5 metres each) in just twenty-four hours. Soon we were in Brussels .. more on that in our next blog. We had been deliberately running one of our two fuel tanks low so we could ensure no trace of our winter ‘red’ diesel was present. In Belgium especially if the authorities think you have used red(un-taxed) fuel for the engine you will be very heavily fined at best. We use some red in the winter for our heating which is all legitimate. Just as we approached the final lock which happened to be closed for the day we saw a very small plastic boat (cruiser-style) with no-one visible on board. Stewart jokingly said “we’d better not crush the little boat” .. and with that the engine stopped so we were gliding straight into him! Luckily Stewart had slowed to the stage where I was ready to throw the rope onto a bollard .. luckily I caught the bollard .. and luckily we therefore stopped just in front him. 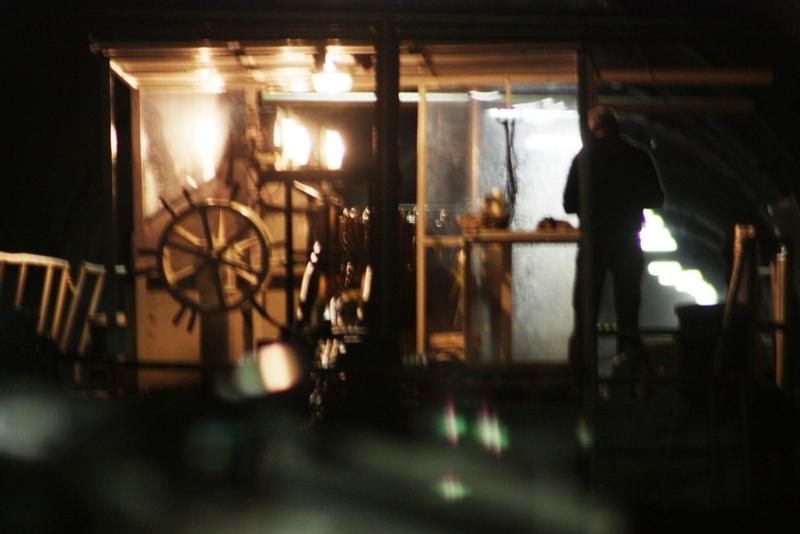 They didn’t know a thing .. and soon after two people popped up from below decks and drove off leaving us on our own. 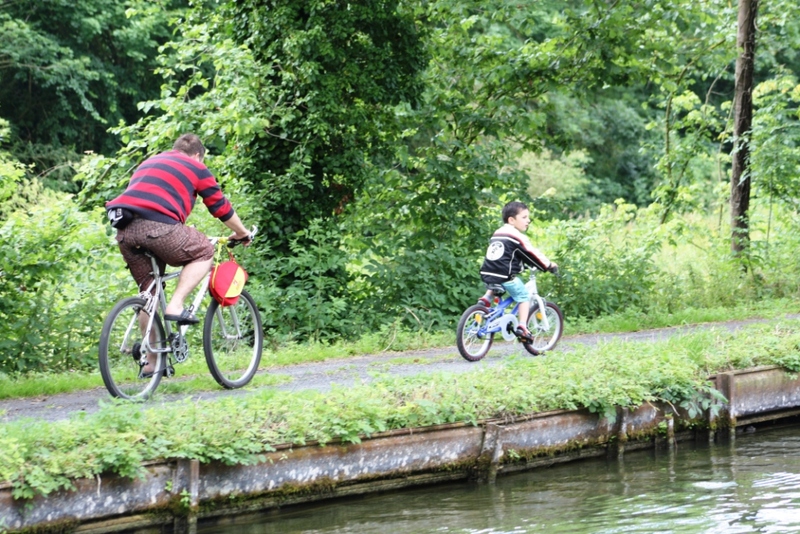 This young chap with dad cycled furiously to keep up with us, following us for several kilometers and watching us lock through, along the canal St Quentin. We now know for sure how much fuel this tank holds – 330 litres not the 360 we’d been told by the builders. Just as we were waiting for a boat to come up through the lock and were floating safely to one side of the canal, the engine stopped. Meanwhile the cruiser coming up was oblivious to the major flap going on, we were engineless knowing we were about to have to keep out of their way. After the flap we found that our engine had pumped through the return valve all of the fuel from the full tank (which we’d switched to, see the point above) to the empty tank. So the engine eventually found its operating tank empty and stopped. As soon as we understood what had happened we switched tanks again and all was back under control as the cruiser exited the lock and glided by waving merrily. They must have wondered where the strong smell of diesel came from as they passed .. and they must have concluded it had something to do with us! The Steyr engine manufacturers have since told us it is possible for the motor to pumps over 200 litres of fuel an hour and as we are only using 10 litres of that, 190 was being returned (and in this case not to it’s source tank). With that we will sign off for now. We have quite a few ‘heart in mouth moments’ to describe in our next blog. Meanwhile, we send love and best wishes to our families and friends. 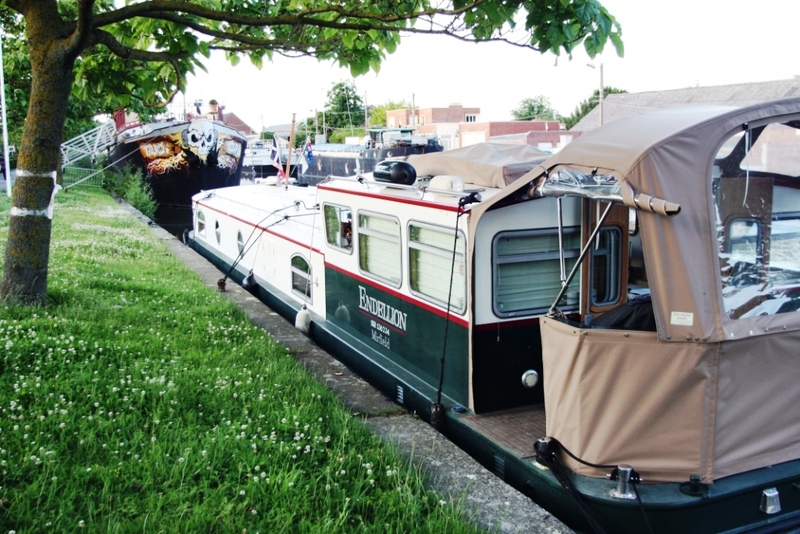 This entry was posted in Accessibility, Waterway life, Waterway services and tagged Endellion barge, Facts and figures, MS, Roubaix, Travel, Wheelchair access. Bookmark the permalink. Hi Stewart and Leseley,amazing pics of the lift at Strepy-Thieu just awsome.Think you should grab one of those 20m fishing rods before your return,youed be able to fish of the balcony at Milsons passage. Hi Dave .. so lovely to have your message. You’re right, one of those major fishing rods would be handy on the pontoon. Thanks for reading, and for being there on the Hawkesbury when we’re not. All the very best.